My dad, Alan Jones, opened Out on The Floor originally and I worked for him throughout my teens. He started with a stall in Camden Market at the weekends and then moved on to various indoor all week markets in Camden before taking on this shop. At the time there was nothing else in Inverness st other than the cafes and normal shops. There were no bars or other record shops. 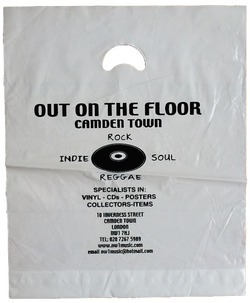 When we opened there were four other record shops in Camden at the time. Rock On, Honest Johns (Rhythm), Record and Tape Exchange and one on Buck St that changed names so many times that I don't remember what it was called. Comment: Ben Jones. ..we had everyone from Robert Smith, Oasis, Alan Mcgee, Nick Hornby, Madness Blur, Marc Almond, Paul Weller, Bobby Byrd and Maceo and loads more. Lots of stories like Johnny Thunders trying to sell us the rights to his image from his album cover when he was out of it and desperate for cash. Comment Ben Jones. I remember Alan very well and used to buy from him at the shop up by the Lock Market and then when he moved to Inverness Street. A shame when he closed down. Comment: Mark Griffiths.